Swansea City manager Garry Monk has described Saturday's Premier League encounter at home to Stoke City as a "defining" game. Having guided the Swans to a Premier League club record tally of 50 points, Monk is now targeting a highest finish of eighth in the division. The Swans currently hold that spot - three points clear of the Potters. "When you think about it, it's probably the most important game of our season," said Monk. "We have got to the stage where we have been in the top 10 for the whole season, we have never been out of it. "It is important we consolidate that position, so it is an important weekend for that reason. "Obviously with the defeat at Stoke earlier in the season you always want to make sure you can avenge any loss." A best Premier League finish is also on Monk's mind. "It is a defining game. 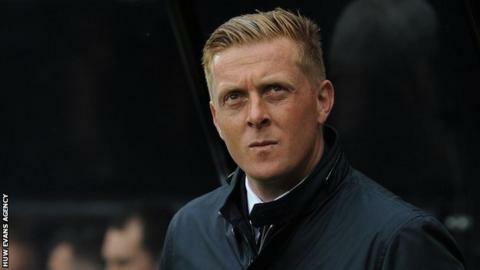 You have defining games throughout the season - at the start, the middle and towards the end," said Monk. "This is our defining game towards the end of the season." Swansea were beaten 2-1 by Stoke at the Britannia Stadium in October, after which Monk said Potters winger Victor Moses should be "ashamed of himself" and punished for winning his side a penalty. At the time Monk called for Moses to be "done for diving, for cheating". Stoke's Welsh manager Mark Hughes responded by saying Monk's comments were "unacceptable". But Monk insists there are no lasting wounds: "I moved on a long time ago. "It's in the past, I don't even give that a second thought any more, what is done is done, we leave it in the past and really focus on the future. "We focus on a very good Stoke side. "Mark has done a tremendous job at Stoke. It is a very tough game for us, a really difficult game, but one we are really looking forward to, I am sure Stoke are as well." Swans' Wales defender Neil Taylor is available after suspension, while Ecuador winger Jefferson Montero has recovered from a hamstring injury.